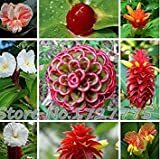 Costus growing herbaceous geophyte of the genus Costus also known as Spiral gingers, Costus perennial evergreen used as ornamental fragrant plant can grow in tropics, mediterranean or subtropics climate or as houseplant and growing in hardiness zone 10b+. 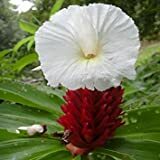 Flower fragrant color can be: white, pink, red, yellow or orange and can be more than one color flowers grow inside bracts. Bracts color can be: red, yellow or orange the shape is hive shape. 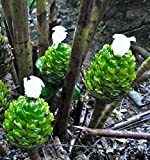 Fragrant flower the color can be: white, pink, red, yellow or orange and can be more than one color flowers grow inside bracts, bracts color can be: red, yellow or orange the shape is hive shape.